When you were growing up where you told to abide by the rules, to behave like everyone else, to -pretty much- look like everybody else? To not rock the boat. To feel and think as you ‘should’? Were you told to blend in? Blending-in seems what society wants in order to prevent people upturning the socio-economic apple cart. To prevent chaos, perhaps anarchy? A society needs to function, agreed, and to that effect we need rules and regulations. But there are times when blending in is not the right path to choose. And then there are times when blending in is the absolute right to do. This is what I woke up to this morning. When I squint my eyes I can almost imagine that the hillside and sky blend together. That they become one in a wintry landscape. That they form the backdrop to a fantasy like Games of Thrones. Much has been made in the last decade about thinking outside the box, which in essence means to not blend in at a given point in time. By thinking differently, alternate solutions can be found. Creativity can become unleashed. Society’s status quo is not always for the best, and in some areas it is not for the best at all. When you have a society where a small group of people benefit the most then there is something wrong and at that point blending in is not what we ought to look for. It is precisely then when we need to look for different solutions, for different guidelines. At heart I do not like to blend in. I don’t want to be like everyone else. Especially when that everyone else appears not to amount to much. I like to reach for the stars. Do I reach them? No, not always, but at least I give it a shot. Blending in sounds so boring to me. But I realize it is not for everybody. Some people like and need the security of fitting in. And that is ok.
As I was contemplating this blending-in issue, I stumbled across some architectural buildings which do just that: to some degree or another they blend in. Not that they do not conform to established building practices and regulations. They do, but from an aesthetics point of view they defy the architectural rule of the month or year. They have become one with their environment, more or less. They almost disappear. They blend in. Lets take a look. 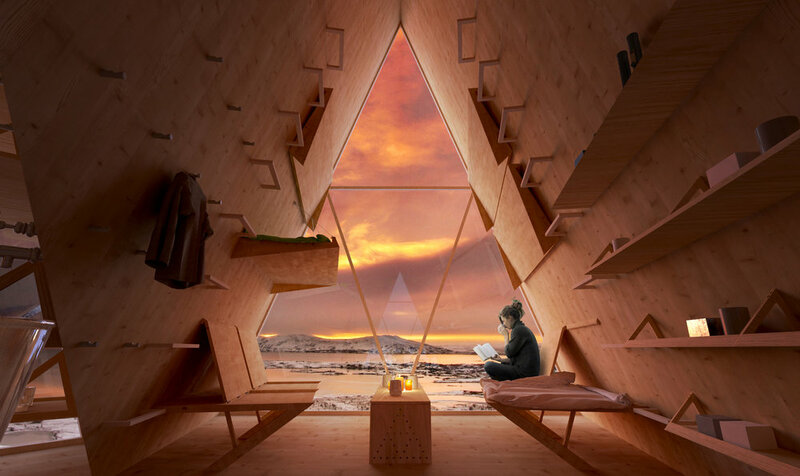 The image above shows a mountain shelter designed by Swedish architects Utopia Arkitekter. 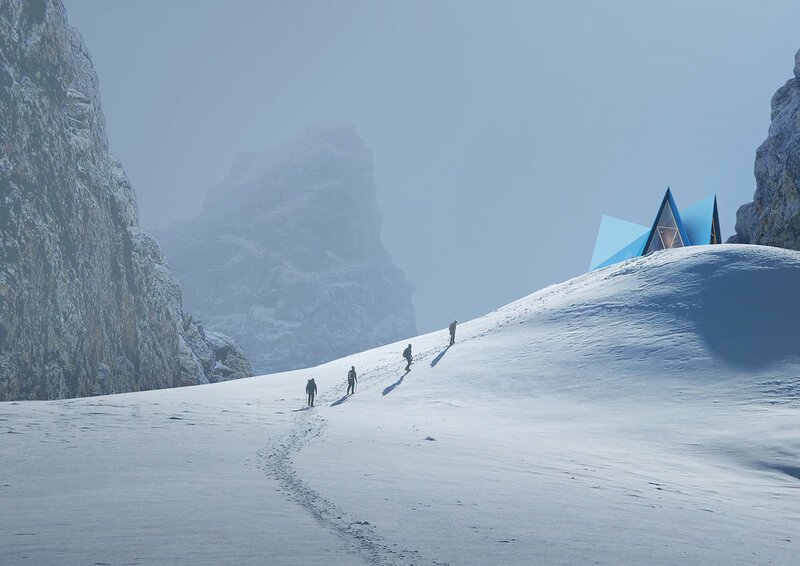 I love how the peaks of the triangular cabin reflect the surrounding mountain peaks. Skyli interior of cross-laminated timber showing pull down beds. The shelter was designed for trekking trails in Iceland. These shelters are important safety features along Iceland’s famous trails. The bright blue outer shell is striking in the cold landscape of snow and ice, yet at the same time almost disappears against the bright blue skye and the blue hue of the snow. The shelters are designed to be easily assembled on site. Modular components are flown by helicopter to the desired locations and in a day or three are fully functional. The shelters are self-sufficient and provide food, water and equipment for emergency situations. Two entries, one on the North side and one on the South side, ensure that one entrance/exit is more protected from the elements than the other. Skyli Interiors - The left interior triangle shows a sleeping section. The right one shows an eating area. The inner shell is primarily cross-laminated timber with loads of benches, shelves, pull-out beds and hooks for trekkers’ paraphernalia. Within the triangles two provide resting and sleeping areas, one is for cooking and the fourth one is for eating and storage. Huge windows overlook the surrounding landscape giving that connection with the outside. The exterior shell is made of steel. The spaces between the two shells are used for water systems, filters and purifiers. A solar panel together with a man-powered generator provide power for lighting, cooking, charging etc. People occupying the cabin provide the general heating. The icing on the cake is a red light at the top of the cabin which functions as an alert in case of an emergency. Makes me want to go hiking in Iceland! When I was living in North Vancouver, British Columbia, it would often happen that birds would fly into the glazing of the sliding doors. From the outside the glass would reflect the surrounding trees and garden and it would confuse the birds. It was always startling and sad when this happened. The birds would not survive. And, I was not the only one experiencing this phenomenon. Other people were as well and some of them plastered colourful strips of paper to the glass; others would hang moving objects from the top of the window frames. Just to scare the birds away so they would not hurt or kill themselves. When I saw the artist studio above, it made me think of precisely that. The studio looks stunning. It is a beautiful addition to the house and it appears to disappear into the dry Arizona landscape. But, what about the birds? Will they fly into those huge glass panels? 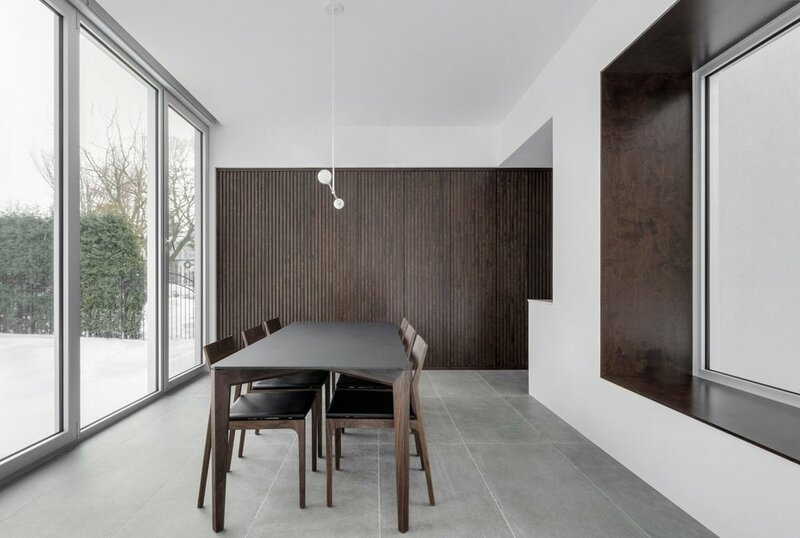 These full height windows and sliding doors bring in so much light. When the weather is balmy, they provide an open connection to the arid desert outside. The back wall of the space provides a large surface to display the artist’s work. It is easy to see that an artist could work here almost divinely. I sure could. Somehow, though, these images reflect a sense of loneliness to me. Perhaps it is the location of the house, or perhaps it is the long shadows from the low sun rays. I am not sure… And again, what about the birds? My heart sighs. 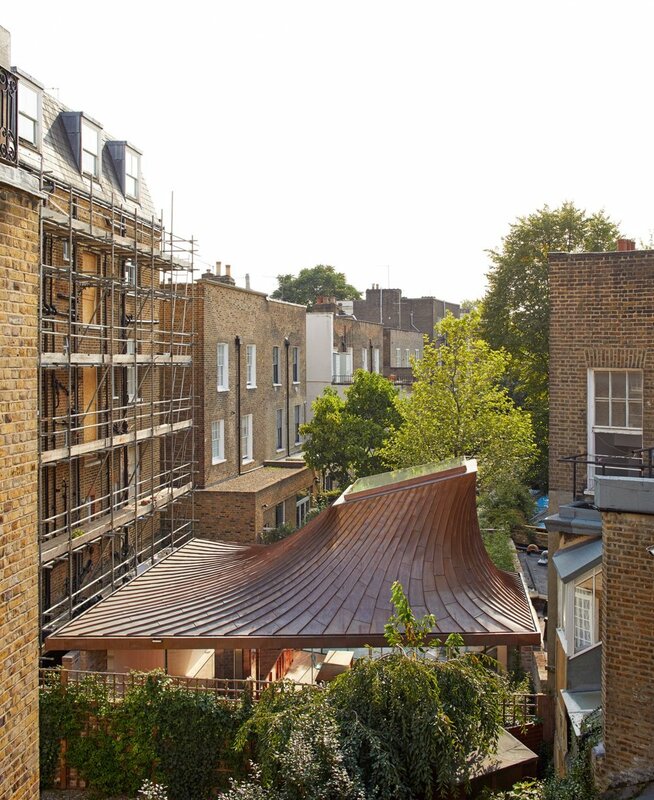 Meanwhile, in London, England, architect Gianni Botsford was living at the top floor of a townhouse complex. He would look down on a boring infill in the garden, a bungalow which he thought was a sight for sore eyes. 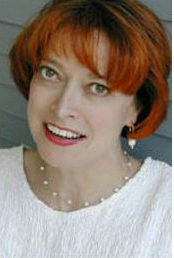 He subsequently worked with the infill owners to replace that old bungalow with a daring and gorgeous new home. 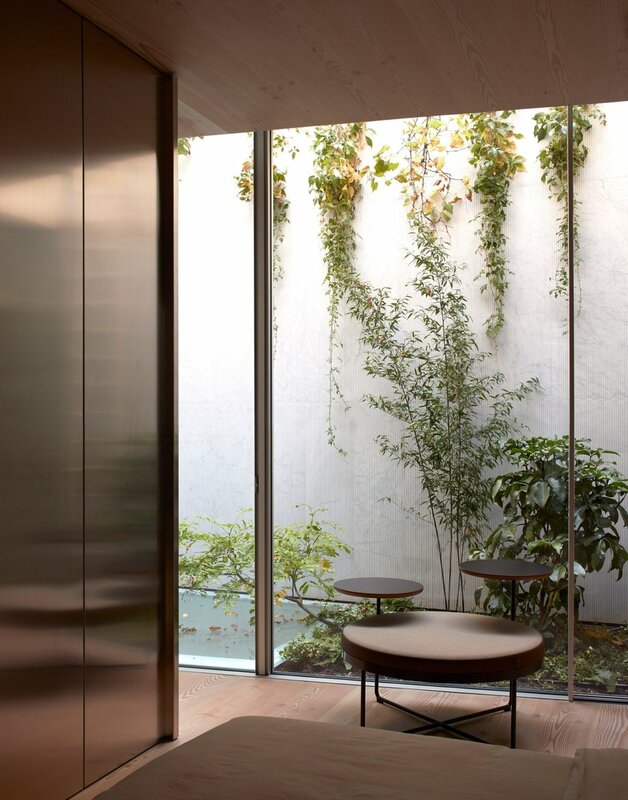 The house is aptly called ‘House in a Garden’. 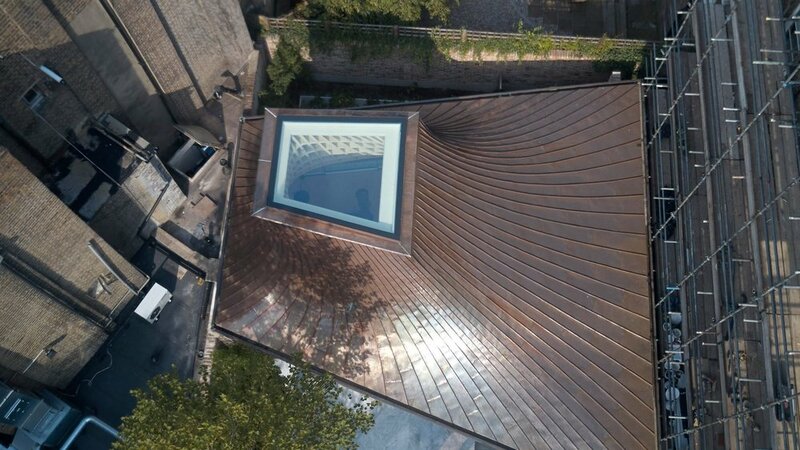 Botsford designed a sweeping, stunning copper roof with a large light well under which the living area of the house is situated. Inside, the structure of the roof is left exposed, creating a beautiful decorative element in the living area. The copper element finds its way inside by showing up as kitchen cabinets, backsplash and countertop. A large wooden staircase leads to the subterranean floor where the master ensuite is located complete with a light well to keep the connection to the outside and to eliminate the feeling (and fact) that your are below ground. But the architect did not stop there: another floor lower he created a sitting area overlooking a lap pool. What luxury! Now tell me, does this home blend in or not? Here is another example of a house that blends in, depending on how and from what angle you look at it. 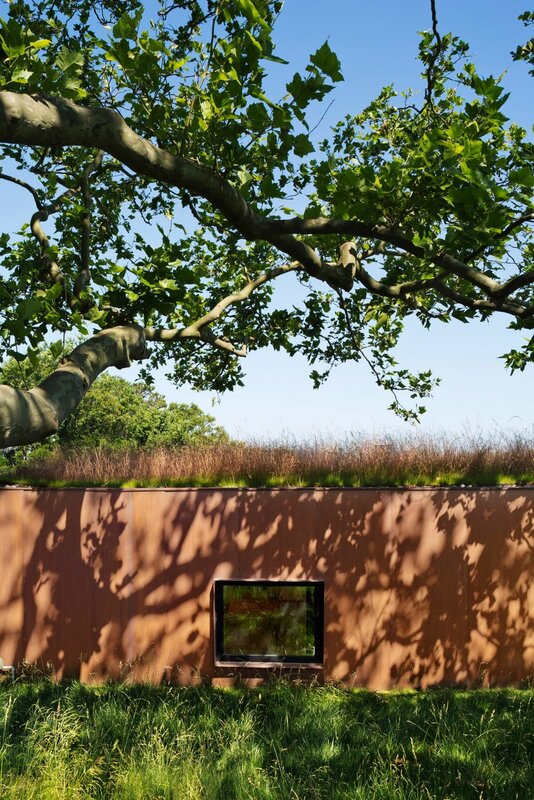 The house is located on Peconic Bay in the Hamptons and was designed by Mapos Studio, New York. An aerial view shows that it can be a bit of a challenge to see it. The exterior of this house is clad with unfinished concrete, steel, cedar and ipe wood. Over time these surfaces will weather and further blend in with the landscape, which is exactly what the architect intended. The house is set into a slope which makes it difficult to spot from the road. Its roof is covered with grasses and shrubbery further echoing its surrounding natural environment. The intention of blending the house with its landscape is carried indoors by choosing an earthy colour and materials palette. Last but not least a residence in Montreal, Canada. In winter time this house will most definitely blend in. Its white exterior will echo loads and loads of snow. And the interior will reflect the frigid temperatures outside. In all fairness, the home does not look lived in which is why it appears cold to me. I do like how the dark wood tone of the wall paneling in the dining area hides storage cabinet doors. This house needs people to warm it up. It needs colour to bring in some cheerfulness, some happiness. It needs kids with toys strewn around. The house needs to come down to a human scale and level. The way it shows, it appears to lofty for me. Regardless, in closing, there are times and situations when blending in is a very good thing! As always, be well and thanks for visiting!